Tokyo Gov. Shintaro Ishihara in 2009. The governor of Tokyo apologized on Tuesday for saying the earthquake and resulting tsunami that left thousands dead were divine punishment for Japanese egoism, a leading Japanese news service reported. "I will take back (the remark) and offer a deep apology," Tokyo Gov. Shintaro Ishihara said at a Tuesday news conference, according to Japan’s Kyodo News. 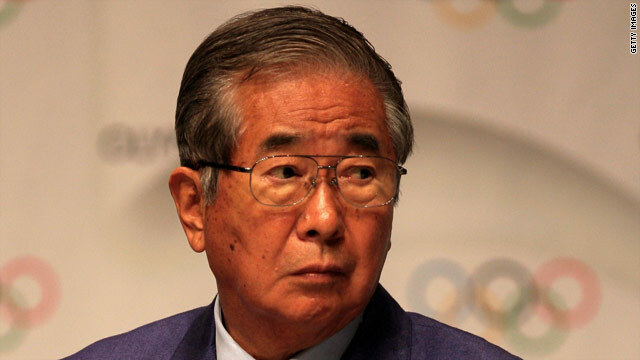 On Monday, Ishihara had told reporters, "I think (the disaster) is tembatsu (divine punishment), although I feel sorry for disaster victims," according to Kyodo News, which translated Ishihara's remarks from Japanese. “Japanese politics is tainted with egoism and populism,” Ishihara had said Monday, according to Kyodo News. “We need to use tsunami to wipe out egoism, which has rusted onto the mentality of Japanese over a long period of time." The death toll from Friday's 9.0-magnitude quake off the east coast of Honshu grew to 3,373 on Tuesday. John Nelson, the chair of theology and religious studies at the University of San Francisco, said Ishihara’s remarks about divine retribution hark back to Japanese Buddhist ideas that fell out of favor decades ago. He said the Japanese term “tembatsu” could also be translated as heavenly punishment. “The way [Ishihara] used it was a prewar understanding of the will of heaven or the gods to discipline the Japanese people,” Nelson said. “That understating of the gods having an agenda was instrumental to the ideology of the prewar years, when it was said to be Japan’s divine mission to conquer Asia and establish an empire," Nelson said. Ishihara, 78, had said he was leaving politics but announced after the earthquake that he will seek a fourth term as governor in this year's elections. Mayor of Tokyo is a big liar. We do not accept your apologize. You and your Son are not the good Leaders. would like to make new friends with you guys. "I can mathematically prove in science that he does..."
You can? Really? You'd better get cracking on that paper, man, and have it peer reviewed. p.s. Can you also prove that he is really a 'he' and has all of those little human personality traits? You don't believe in God? One says life is too short to believe in fairy tales? What sad people. You have no hope beyond the pitiful lives that you live. This is an absolute guarantee: GOD DOES EXIST! AND HE DOES LOVE YOU! But to those who mock God and say Jesus is nothing but a fairy tale, you will find out soon enough in this brief life the pains of your mistake. Imagine a place where there is no love, no light, no water, no beauty, no hope; only pain and despair beyond that which no human can imagination. THAT IS HELL, AND IT DOES EXIST! I hope you do not have to find that out first hand. Thank you, BF. Don't shut up. Why should he apologize? It's not like he works for a national broadcasting agency. He should be able to verbalize his thoughts. When noting the Full Nature of Reality on a matter it seems very obvious that when you are working of the edges of functionality (being a life guard or just trying to survive) one is taking serious risks. When we "slip up" on our analysis, or find no other way to persist; we can meet the balance of the equations we would rather have address by more remote support systems. The prices man pays to become wiser, or more functional, can be very high. And those following them should respect those that had to pay it; lest they fall to blinding themselves to the clearer visions they gave us. The details are often not "so simple" or they would have been done before. God help us all in Jesus' eternal nature. I do not KNOW if a God does or does not exist. But for those stating religious views are "fairy tales" I say, maybe you are right. But is there anything wrong with that? Generation after generation pass down Grandma's trick to cure a common cold, for example, and sometimes they work. Sometimes they do not. But most of the time there is no scientific proof to back up their miracle cures. They just seem to work. Perhaps, just believing they work makes a person feel better. Perhaps, just believing in God, puts a person's mind at ease. That no matter how crappy life seems, they have hope that one day someone will save them. I do not find that childish, arrogant or ignorant. Maybe it is possible that the Bible was created just to help set people in the right path and become the best human that they can be, instead of becoming an egotists who believes their career is their #1 purpose in life, as oppose to actually making a useful contribution to the planet. For whatever reason, I see no harm in anyone's religious beliefs or the fact that they want to share them with others (as long as they are not knocking on my door on a Sunday afternoon). What I do see wrong with this picture is that this governor has to apologize for his beliefs. No one has the ability to please all people without bruising a few. So sick of the whole PC movement! And if only all politicians really said what they believed, we would be able to select a better pool of them. I also don't know if a god (or many gods) exist, and neither does anyone else... It's OK to not know... It's when you falsely claim to have the answers that the problems start. When you invoke the name of whatever Deity happens to be in favor in your neighborhood in order to control the behavior and thoughts of others (often including the use of force) the problems become serious. Organized religions have put an awful lot of effort into stifling independent thought and have done a good job keeping the progress of mankind (science, technology, medicine, etc.) to the bare minimum. Ha ha many Gods exist ha ha,well guess that the sound of tender is the sound of them fighting,and the lightening is them throwing fires against each other?? So maybe JP was belonging to one of the Gods and another Jealous God came and shock it down to earth...so now the other God will destroy another land of the first God in rev-an-ge?? He's not apologizing for his beliefs. He's apologizing for a statement he made. You can believe anything you want, but if you open your mouth and declare things to other people, you'd better believe some will take exception.